The purpose of an email campaign is to be opened and entice your readers to take action. 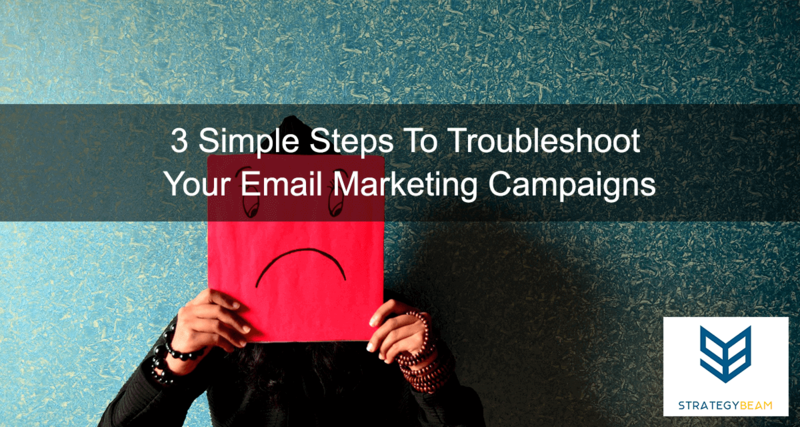 When this does not happen, you need to troubleshoot the email marketing campaign to see where you can optimize the email to increase sales. In a previous post we looked at the best metrics to measure for email marketing, so be sure to read that post if you haven’t. From the moment you hit “send” to the time your reader makes a purchase on your website, your email marketing campaign will consist of several stages of this process. Each stage is unique in its own way, and each is essential to the success of your email campaign. The ultimate success of an email campaign is to have some receive, open, click, and buy from your website. However, it is important to understand that each stage of this process has its unique challenges, so identifying barriers and optimizing to increase conversions is also a goal of an email marketing campaign. Looking at your stats in context to each stage of your email campaign will give you a good idea of your audience interests and needs. This approach also helps frame your emails and increase your success, with the ultimate goal of making more sales. Your reader opened your email! Congratulations! Your reader engaged with your brand at this point, so you know they have an interest in your brand, and you have a stellar subject line. You also know that your brand holds value to those readers who opened your email. This is the first big hurdle of a successful email campaign, because if your audience doesn’t read your email, then they can’t take action and buy. Subject Line: Your subject line is terrible. This is the single most important factor to consider when you have a flat Open Rate. Preheader: Make sure your preheader is enticing and gives an excellent summary of your email content. Deliverability: You should have a Delivery Rate of 98-100%. If not, then you have a bad list, or you need to check your content because they are getting caught in Spam filters. Sending Date, Time, and Frequency: Your time and date of delivery could be wrong for your audience. Try different time and different days. Also, check the frequency you are sending. Test different rates to see if you carry more or less makes a difference. If your audience clicks on your Call To Action or calls you then you know, your content and subject line are inline with each other. You also know that you have a straightforward copy that grips the reader. This part of email marketing is the hardest part, so if someone clicked on your CTA or took action then you know you are doing something right! The “Click Through” stage of interaction with your audience is one of the most important and hardest to get right. This stage is defined by your audience taking action to progress to the next phase with a landing page. Email Design: Make sure your email design is optimized for your audience. Don’t waste valuable real estate with an image at the top, especially if it doesn’t add to your purpose. Copy: Check the structure of your text. Keep to short (2-3 sentence) paragraphs with lots of white space. This makes reading emails easier on mobile. Consistency: Is your copy consistent with your subject line? If you entice people with a great subject line, then your text needs to reflect that same idea. Length: Is your email short, hard-hitting, and to the point? Your email needs to get people to click off the email, not tell them a long story. The shorter your copy, the more your CTA will stand out. Call To Action: Do you have a strong CTA (hopefully several)? Does the color make the CTA blend in? Do you only have one? Directing your readers through your email campaign is the primary goal for a business. Guiding your reader through each stage can be difficult, but once they are on your landing page, it is the job of the landing page to convert them. This means that at the point where your reader clicks off your email and onto a landing page you know your email campaign did its job. However, the goal of the campaign has not been met so we want to look at whether the landing page is holding its weight or losing you money. They know and trust your brand. Your email subject line caught their interest. Your email copy was engaging and compelled them to act. The landing page is one of the last stages of the sales process that your audience will take before making a purchase from your business. If your customer has come this far then, you know they are interested in your product/service and have the intent to take action. While the landing page is not directly rolled into an email marketing campaign, it plays a significant role in overall conversions so it can be a good idea to review landing page conversion rates. You don’t want to put a lot of time into the email campaign, just to have your audience drop off on the landing page and not make a purchase. That can be frustrating, and hurt your bottom line. Headline: Be sure that your headline is engaging and catches your reader. You can look at your Time On Page as an indicator if people are exiting your page quickly. If so, your headline might need work. Copy: Make sure that your content is powerful and captures your readers. Expectations: Did you meet your reader’s’ expectations? If you promised something in your email but pulled a “bait and switch” then your readers are going to mistrust you and won’t take action on your landing pages. Your business can now make more money since you know how to optimize your email marketing campaigns. Use these tips to improve your email Open Rates and Click Through Rates, and grow your revenue with tips for your landing pages! Do you need some help to optimize your email marketing efforts? Check out how I can help your business make more money with email marketing! What are your tricks to increase Open Rates and Click Through Rates for email marketing? Let us know in the comments below!